I grew up in Salinas, CA, a small farming community near Monterey Bay on the Central Coast of California. I always knew I wanted to work in the health care industry and help people achieve a higher level of wellness. When I was a college student I learned about the role of nurse practitioners and knew that this was the perfect fit for me! When I was a college student I worked nights as a certified nursing assistant in a small hospital in my home town and was able to put myself through nursing school. After graduating as a registered nurse, my husband and I moved to the greater Sacramento area. I continued working as a registered nurse in the areas of surgery, aesthetics, and outpatient procedures while obtaining my Bachelor of Science in nursing and finally my master’s degree as a family nurse practitioner. 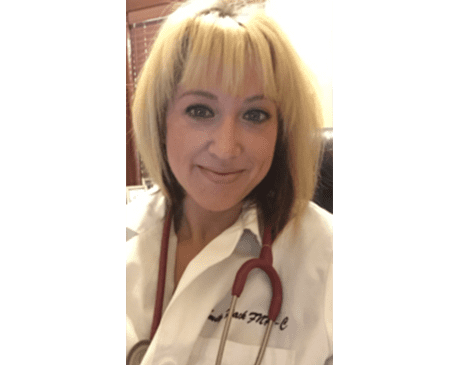 I have worked as a nurse practitioner in the areas of occupational health, family medicine, post-acute geriatrics, internal medicine, bariatrics and aesthetics since 2010. I am married to my wonderful and supportive husband and have two adorable sons. I enjoy exploring the outdoors, hiking, camping as well as finding exciting places in the surrounding cities to relax, enjoy great food, and have fun with my family! I have a particularly high interest in assisting my bariatric patients with weight management. As a person who formerly suffered from the disease of obesity, I feel I not only have the knowledge and expertise to treat bariatric patients, I also have a special level of empathy and understanding as someone who has struggled with weight loss myself. I thoroughly enjoy assisting my patients with navigating the difficult transition to a higher level of wellness through lifestyle changes with nutrition counseling, advise on exercise, as well as medical weight management through a variety of treatments such as assisting patients with referrals to bariatric surgery when appropriate, prescription and over the counter medication management, and personalized care with a variety of specialized supplements when necessary. As our practice focus on individual wellness grew, we noticed that our patients often have a greater sense of confidence and well-being when they feel and look their personal best. Many of our patients inquire about aesthetic services such as injectable fillers and Botox®. With my previous background in aesthetics as a registered nurse, I decided that bringing aesthetic services into our practice would be a great benefit to our patients. After all, when you feel good about the way you look on the outside, it often helps you achieve a better sense of wellness on the inside! We are now very excited to offer a variety of cosmetic and aesthetic procedures to our patients in addition to our traditional medical services.